Article first published on 10/12/2009. Remarks: 4 radials layout at 45 degrees. Simulation at 7 meters over perfect ground. 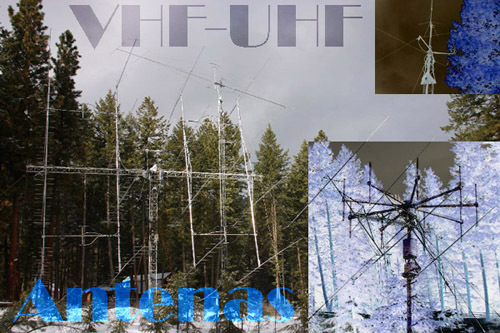 The antenna is made of a quarter-wavelength monopole for 146 MHz, plus a ground plane made of 4 radials separated 90 degrees between them and bent 45 degrees from the monopole. 2. Standing wave ratio (SWR). The fig.3 shows a plot of the SWR for a characteristic impedance of 50 ohms. 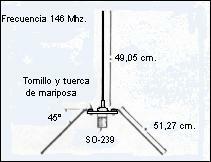 The SWR at the central frequency (146 MHz) is 1,4. The fig.4 shows the radiation pattern resulting from the simulation. 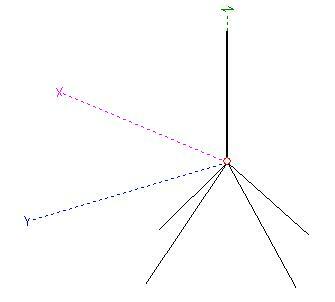 The antenna is omnidirectional with a gain of 7,91 dBi. 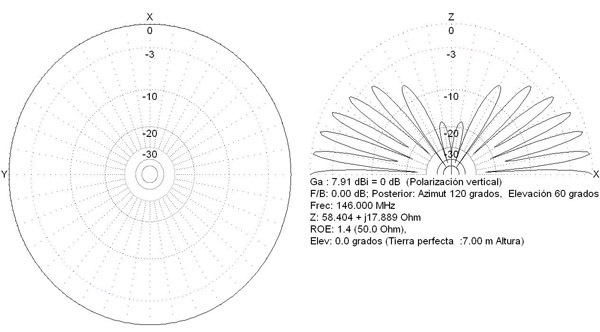 The fig.5 shows the input impedance of the antenna, computed with MMANA-GAL between 144 MHz and 148 MHz. The input antenna impedance at the central frequency (146 MHz) is 58 + j17 ohms. (c) 2008-2019 - Ismael Pellejero Ibáñez - EA4FSI - 28T1 || Contact form || Site map || Page last updated: 30/01/2011.